The formation of a soccer personality includes most particularly the correct social behaviour, aside from multiple important developments (e.g. self-confidence or ability to respond positively to criticism). 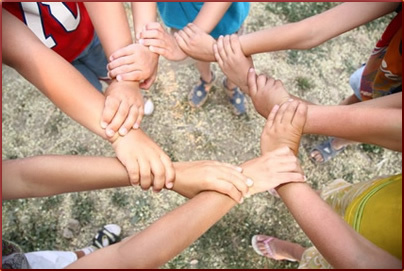 Children and adolescent persons join our clubs with the motivation: “I wish to play soccer”. Other elements linked to joining a soccer team are mostly underestimated by kids as well as their parents. For this reason, each new entrant should be clearly informed in a personal talk that ability to work as a team and correct social behaviour are basic requirements for a harmonious team climate. Without a sensible climate, playing soccer will not bring about enjoyment. These talks ought to be repeated ever so often and never be absent from any team discussion or parents meeting. 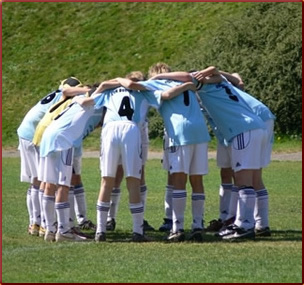 Only a good team climate will result in simpler and long-term soccer success; whereby the team does not only consist of players and trainers but in fact of the entire surroundings: club, caretakers, parents, siblings, relatives and friends can be made part of the team events through various activities. The rules of conduct in a social community such as a soccer team are precisely a reason for many young people to abandon club soccer play. Other types of sports, most particularly the constantly new American outdoors activities, offer adolescents the advantage not to have to integrate into a social community. Punctuality, team play or reliability is ‘uncool’ and not a positive characteristic. This is why we should make sure that our children get used to certain rules of conduct at an early stage. Only then will these rules become a normal part of life and do not remain forced instructions. This is an important educational objective, not only for soccer life. The team is waiting for me! Without me the team is not complete! My unpunctuality is disruptive to the entire team! I try not to miss any training. It is unfair to frivolously cancel training, as my trainer has prepared and invested time for it. I cancel in good time I cannot come to the training session. My trainer and the team are worried if I simply do not show up for training. By failing to attend practice I not only block my learning targets but also the team. I and my time will learn how to play soccer only through training. If we wish to be successful we need to practice. Participation is a matter of course for me. I often know the dates well in advance. If I cannot show up, I personally inform the trainer as early as possible. I shall exhaust all possibilities in order to participate in the games. Schedules for invitations to birthdays or family celebrations can often be modified with the simple notice “I have team responsibilities. The team expects me to be there”. My parents assist me in my undertaking to learn the soccer game. Friendliness goes for me without saying. The team and the entire surrounding make it possible for me to play soccer. I may not be able to like everybody to the same extent but shall accept each team colleague. It is easy for me to be nice and friendly. Example: I greet children and grown-ups known to me. The surroundings will not only like me for being friendly, but also my team. By being impolite I do damage to my team. I comport myself with discipline within my team circle. I can learn soccer and achieve my goals only within the team. Soccer is a team sport. Can I win by myself? No! Each one on the field has to strive for that target while integrating into the team. How to we successfully play soccer? By me learning how to play soccer. Only in this manner can I be of help to my team. I always give 100% in play and practice. I am an important part of the team and place myself fully at the service of the team. I take good care of club property. The field, the locker facilities, shower rooms and all other common areas should be preserved long term for the enjoyment of my club, my team and me. The sensible handling of balls, jerseys and practice gear is understood. As guest at another club’s premises, the mentioned principles apply even more strongly. Failing to adhere to cleanliness principles is not only detrimental to my team but also to my club. I am ready to help any team member having a problem and asking for help. If my club asks for help (e.g. group work) I shall immediately assist within my means. I take care of removing balls and training gear after play or practice. I also accept weaker team members and provide tips for their improvement.